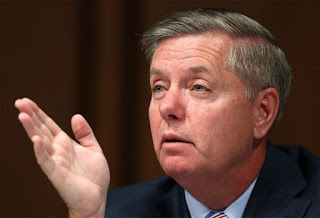 I am a Republican [at least still at this moment] and I like Senator Lindsey Graham, R-SC. But, just as I am dismayed [and sickened] by Democrats who didn't immediately call for their fellow congressmen, Conyers [in the House] and Franken [in the Senate] to resign and leave office after very credible evidence of many episodes of sexual harassment against them, I am equally dismayed when my fellow Republicans won't call out the president for his juvenile, and destructive tweets when asked about them by reporters. They will either say, oh I haven't seen those tweets, or if it were me I wouldn't do it, or like Lindsey Graham did try to deflect blame on the media for daring to bring up the subject. In fact, Lindsey said he was sick of the media focusing on the president's tweets, looking like their trying to label the president as a "kook or unfit for office".